Two thousand Ghanaian entrepreneurs are to benefit from a GH¢30 million development training programme under which they will be attached to Spanish companies for further building of skills. under the project, a broad collaboration framework will be established to provide training and consultancy services to promote entrepreneurship and the application of technology to consolidate local Ghanaian businesses. The programme is expected to take off in March 2019. An agreement has since been signed between the Ministry of Business Development and the Institute for the Creation and Development of Enterprise (INCYDE) Foundation in Spain. 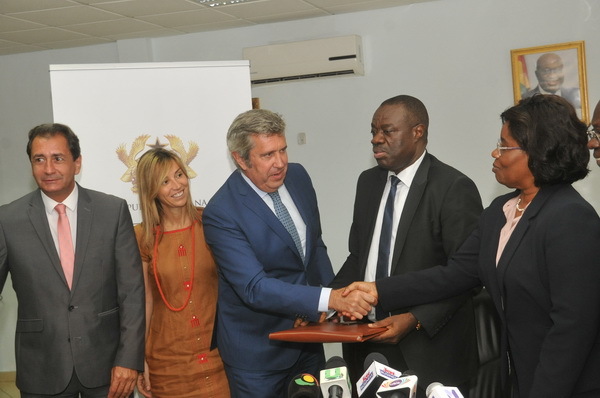 CASA Africa, a Spanish-based organisation that promotes good understanding and trust between Spain and Africa in several fields, is also supporting the agreement. The Minister of Business Development, Dr Mohammed Ibrahim Awal, signed for the government of Ghana, while the General Manager of INCYDE, Mr Javier Collado, initialled for his organisation in Accra yesterday. The University of Ghana Business School is partnering the ministry on the project. About 52 per cent of Ghanaian women entrepreneurs will be among the beneficiaries. Under the agreement, some of the entrepreneurs will be sent to Spain on attachment, while, in some instances, Spanish entrepreneurs in Ghana with expertise will also train their Ghanaian counterparts in various fields to enable them to establish their own businesses. According to Dr Awal, about 75 percent of businesses in Ghana usually collapsed in their initial stages as a result of factors including the lack of expertise to compete globally. “Ghana can only compete with global giants when we have entrepreneurs who are well grounded to produce goods that can be marketed beyond the shores of Ghana,” the minister said. Dr Awal said the country could leverage on the expertise of INCYDE to support Ghanaian entrepreneurs to compete globally with the right finance model, good marketing and branding and proper networking. The Spanish Ambassador to Ghana, Ms Allicia Rico, stated that the government of Spain had chosen to reinforce cooperation with Ghana in the context of the President’s vision of a Ghana beyond aid. She lauded the government’s job creation agenda and said “Spain will support Ghana at this important moment in history in its job creation agenda”. For her part, Ghana’s Ambassador to Spain, Ms Elizabeth Adjei, said her outfit was working closely with organisations in Spain to promote Ghana’s interest in the areas of business and culture. According to her, Spain viewed Ghana as a strategic partner as a result of the prevailing political stability, coupled with the positive investment climate in the country. “Spain has a long tradition of training entrepreneurs and Ghana can leverage on that expertise to support its entrepreneurs,” she added.